My goodness, I cannot believe that I did not post at all in August. That makes the first month that I have not posted on this blog since I started it in January, 2013. August seemed to fly by. I finished my summer semester and drove off to New Brunswick and Nova Scotia for two and a half weeks with my boyfriend, Tom. It was a much-needed vacation that left me feeling rejuvenated for the coming semester. We visited my extended family in Bathurst, saw some good friends from undergrad in Halifax, then spent a week rock climbing in Welsford, NB. It was an adventurous yet relaxing time spent in nature away from the city life. Our camp site was in a patch of trees on the outskirts of a farmer’s field, just far enough away from the horses, sheep, and goats, and right beside a cemetery. We were the only campers for several nights, which was a bit creepy at times, but also refreshing. I’m thinking that the vacation was just what I needed to start the last year of my master’s degree. Needless to say, I did not do much cooking during my trip. I was graciously fed by relatives and delicious local restaurants along the way. We tried three great restaurants from the show You Gotta Eat Here: Tide and Boar in Moncton, The Armview in Halifax, and Taco Pica in Saint John. Other places that I recommend are Stillwells and Two Doors Down in Halifax, and Thandi in Saint John. I would like to share with you my recipe for pancakes. 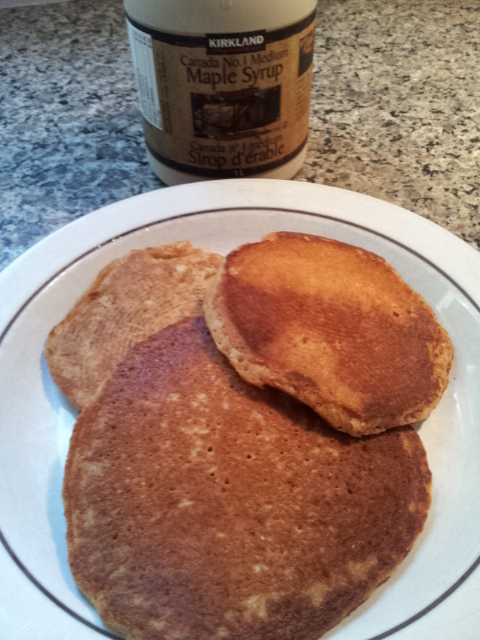 It was a fun realization that vegan pancakes can be just as delicious without eggs and butter. I must say, though, that my cousin-in-law John makes delicious pancakes that happen to be non-vegan. The fun thing about eating flexitarian is that when I do eat non-vegan food, I am hyper-aware of the flavours of animal products. That means that I can appreciate what the eggs and butter add to the pancake, but also appreciate the vegan alternative that is also delicious. Here is the recipe that I have used over and over for the past year or so. I got it from food.com. In a bowl I stirred together the dry ingredients: flour, sugar, baking powder, and salt. In a measuring cup I mixed together the soy milk, oil, and vanilla. Then I added the wet ingredients to the dry ingredients and whisked until smooth. I preheated a frying pan on medium heat and added about a tablespoon of coconut oil. I then spooned a half of a cup of batter into the frying pan and made sure that it spread out to about 1/4 inch thickness. I let the pancake cook until bubbles appeared ontop, flipped it, then let the other side cook for another couple minutes. This recipe makes about five pancakes. If I am making it for more than two people I will double it. I find that for a filling brunch each person will eat about two and a half pancakes. In the past I have drizzled maple syrup, topped the pancakes with blueberries or bananas, and have also drizzled a fruit sauce on top. I make this by boiling fruit with sugar until it reached a thick consistency. Either way, this pancake recipe has made a delicious Sunday morning delight.